I had an email this morning from a Julie Roome, whose grandfather, Arthur Colban worked for Laughton/Eddystone as Security Guard/Timekeeper at the West Heath factory for 22 years from 1938 until his death in 1960. At the time of his passing, boss of Laughton’s George A Laughton sent the family a letter of condolence (reproduced below) and stating that Arthur had joined the company when they took over the Globe Factory of O.C. Hawkes. 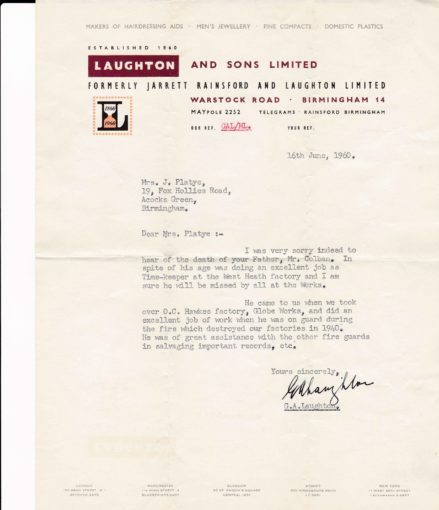 Mr Laughton mentions Arthur’s excellent wartime service with the company and the outstanding work he did when on duty during the bombing of the company’s Bromsgrove Street factories in 1940. 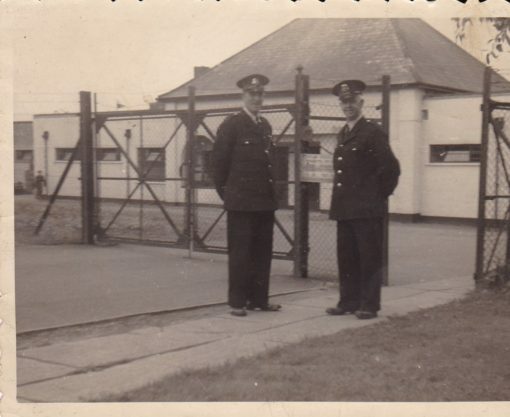 The picture shows Arthur (on the right) with a colleague outside the West Heath Factory. A nice bit of Eddystone history.